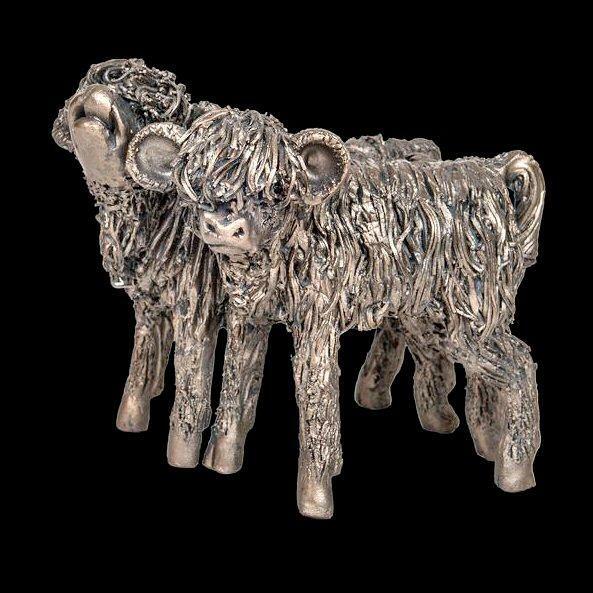 Delightful sculpture in bronze of a pair of Highland heifer calves from the Frith collection by celebrated animal sculptor Veronica Ballan. Although synonymous with the wild uplands of western Scotland, Highlanders are actually found in many far flung places around the world - places where their unique ability to thrive in the most challenging of conditions makes them highly prized. An expertly crafted sculpture in hand finished, cold cast bronze - it would be perfect displayed along with one or more of the adult Highlands Bulls or Cows in the Veronica Ballan collection. Supplied securely boxed and packaged.